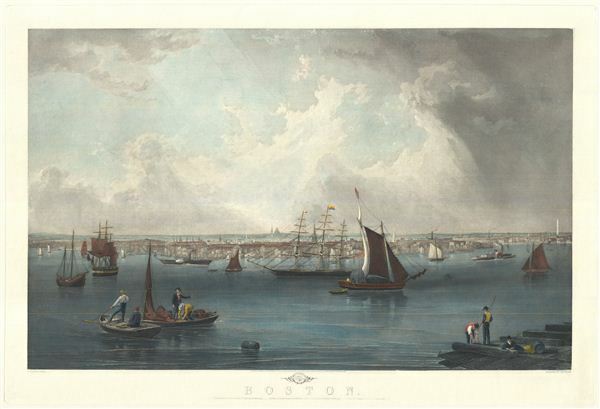 An extremely attractive panoramic view of Boston Harbor by J. Hill and Charles Mottram. The view reveals a busy harbor with ships of all nations and types plying the waters. In the foreground fisherman and dockworkers ply their trade. In the background the Bunker Hill Monument as well as various church steeples are clearly visible. This view is dated 1857, but we believe it is most likely produced later. Many of Mottram's view plates survived well into the 20th century, including this one, and went through several printing over a long period, often with wide intervals in between. Importantly, the views produce from the various printings are not reproductions, rather they are later restrikes from Mottram's original plates. Since the plate was not modified or updated in any way, determining the exact imprint is all but impossible. Our assessment of this example as a 20th century restrike is based upon the quality and texture of the paper, though admittedly similar paper also existed in 1857. As it may be, the piece remains stunning and has been priced accordingly. Charles Mottram (1807 - August 30, 1876) was an English steel plate, aquatint, and mezzotint engraver active in the 19th century. His work includes a vast corpus of views and illustrations ranging from engraved issues of famous paintings to unique city views. Mottram's work is admired application to steel plates of "sky tints" with the use of a ruling machine. Many of Mottram's plates enjoyed enduring popularity and were reissued well beyond his death into the 20th century. Very good. Minor damage out outer margins relating to older framing.